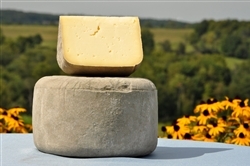 Whether you want to call it Welsh Cheddar or Caerphilly or Misty . . . you are going to love this smooth cave-aged Cheddar cheese. Each sales until contains 1 full pound of cheese, vacuum-sealed. We recommend removing this cheese from the packaging and storing in butcher paper once it makes it home.